Oil of Olay is a household name today for beauty lovers. Since its inception, it has offered hundreds of beauty products to the public. Today, this company focuses on meeting basic skin care needs and addressing the signs of aging. Oil of Olay was first invented in the late 1940s in South Africa by an innovative chemist, Graham Wulff. The product was tested on the wives of various chemists, and deemed worthy of international success. Many women who were children in the 1950s will remember that their mothers' Olay products were packaged glass bottles and filled with a pink substance that was somewhat liquid-like, compared to the consistency of most of today's creams and moisturizers. Early on, the products were not mass distributed. Instead, it was only sold to stores based on the store's requests. Usually, so many customers would ask for Olay products that stores would keep their shelves stocked. Not long after its introduction, Olay products were available all over the world, including Australia, the Netherlands, Germany, and the United Kingdom. In 1970, the original inventor of the company's base product sold the company to Richardson Merrell, Incorporated, which later became known as Richardson-Vicks, Incorporated. After the acquisition, Olay appeared in all sorts of advertising mediums, including television. In addition to being mass marketed, distribution spread to more international countries, mostly in Europe. However, the brand name was slightly modified in many of the countries where it was sold. In 1985, Procter & Gamble became owners of the company that had acquired Olay in the 1970s. Now in control of Olay's future, Procter & Gamble decided to create many different product lines and also expand to even more international countries. Both of these choices led Procter & Gamble to turn the skin care giant into a billion dollar company by the early part of the 21st century. Oil of Olay has had many advertising slogans associated with it over the course of its almost 50-year existence. One of its most popular is "Love the Skin You're In." Definity: An anti-aging line with a moisturizer, hydrating cream, and corrective lotion. Regenerist: A line designed to reactivate and refresh skin through exfoliation and moisture. Products include a microdermabrasion system, thermal polish, exfoliating cloths, hydration cream, daily and eye-lifting serums, night recovery cream, and targeted tone enhancer. Total Effects: This anti-aging line has been developed with the aid of seven vitamins and minerals, including vitamin E and pro-vitamin B5. It includes serums, moisturizers, cleansing cloths, and restoration treatments. 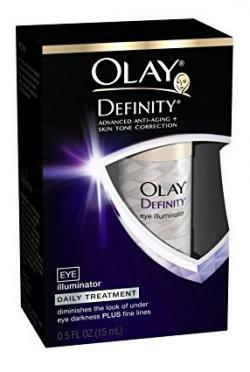 Complete: In addition to a wide range of UV protecting body and facial lotions, Olay Complete also includes tinted moisturizers and night creams. Touch of Sun: Well aware of the damaging effects of the sun, Olay has designed this self-tanning line to help women achieve a healthy glow without being subjected to the sun's harmful rays. You can look great with your swimsuit without having to pay for it with sun damage! Clarity: A gentle but effective acne skin care line, Clarity includes a toner, cleanser, cleansing cloths, and scrub. Daily Facials: Making facials easier for today's busy women, Olay offers Facial Express, a line that consists of cleansing cloths, foaming disks, masks, and makeup remover. Although many products cater to women's facial skin, a variety of body washes and body lotions are now available in addition to the well known Olay cleansing bar. Other additions also include an Olay vitamin line. The company teamed up with Cover Girl to produce Advanced Radiance cosmetics, which contain Olay ingredients. In addition to their high quality, Olay products are quite affordable. Many of the company's products are available at mass merchandise stores, such as Wal-Mart and K-mart, as well as drugstores and the health and beauty section of most grocery stores. You can also purchase online from Amazon, CVS.com, Drugstore.com, and Walgreens.com. Club Olay is a free program that offers consumers occasional free product samples, coupons, and informative emails about new products and company news. Since there are quite a few Olay product lines currently on the market, some women may want a bit of advice on which products to choose. The Olay Skin Advisor is available for anyone who has questions about products. The Consultation Counter is open five days a week (Monday through Friday) from 10 a.m. until 8 p.m. (Eastern Time) and can be accessed from the Olay website. While most Olay products are marketed to adults with aging skin, some of the products may be beneficial to teenagers. For example, Daily Renewal Cleanser has been known to help clear up acne. Young women may also benefit from their anti-aging products, since it's never to early to start wrinkle prevention. More information on each of the Olay products is available on the Olay website.